Questions about modular representation theory of finite groups can often be reduced to elementary abelian subgroups. This is the first book to offer a detailed study of the representation theory of elementary abelian groups, bringing together information from many papers and journals, as well as unpublished research. Special attention is given to recent work on modules of constant Jordan type, and the methods involve producing and examining vector bundles on projective space and their Chern classes. 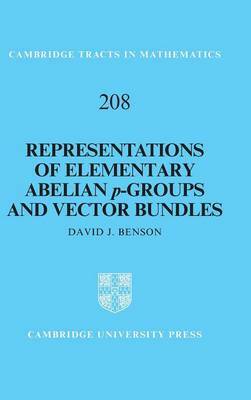 Extensive background material is provided, which will help the reader to understand vector bundles and their Chern classes from an algebraic point of view, and to apply this to modular representation theory of elementary abelian groups. The final section, addressing problems and directions for future research, will also help to stimulate further developments in the subject. With no similar books on the market, this will be an invaluable resource for graduate students and researchers working in representation theory.